[By Nick] ‎If you don't know, I recently got my own apartment in an attempt to move closer to my new college. My mom thought it would only be appropriate to get me an ice cream cake as a going away present. While I was expecting her to grab one of those traditional friendlys / carvel cakes, I was pleasantly surprised when I saw this Chips Ahoy! Ice Cream Cake in my freezer. I've been eyeing this one for about a year now but just couldn't find the right occasion to justify a purchase. Thankfully my mom knows me all too well. and chocolate chunks, topped with rich fudge and whipped icing & chocolate chips! I mean come on, just read the description. If that doesn't sound good to you well it looks even better! 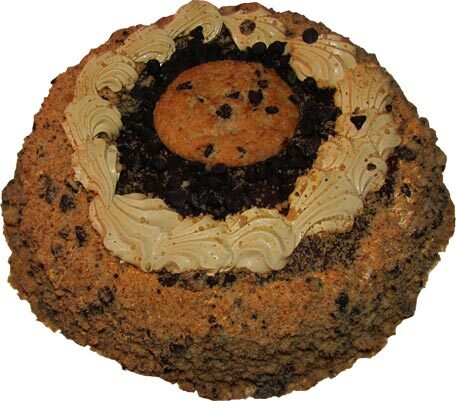 After Dubba's lackluster experience with the new Chips Ahoy Blizzard, hopefully we can bring some redemption to that brand with this cake. Oh wow, the cross section looks awesome! There's cookie bits and chips peppered throughout the already cookie flavored base. This one just hit the trifecta, not only does it look and sound perfect, it might just be my favorite ice cream cake I've ever had. The ice cream itself tastes exactly like a milk soaked cookie. This is leaps and bounds better than Breyer's Blasts! On every level. ‎The Chips Ahoy! cookies are everywhere in different applications throughout the cake. While the majority of the cookies in the ice cream itself are soft, the cookies on the outside retain their crispy, crunchy texture. Heck, even the frosting tastes like a cookies. 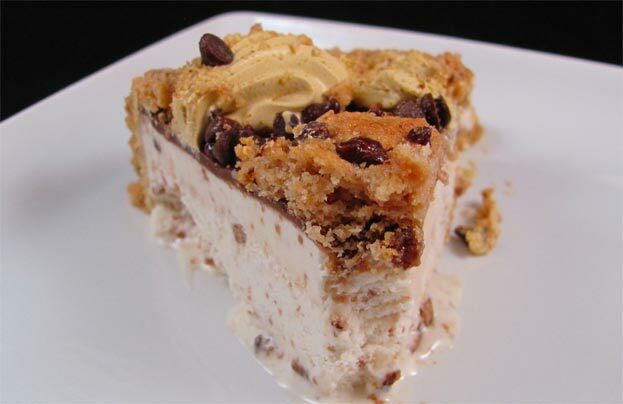 The fudge and chocolate chips add more to the textural masterpiece of this ice cream cake. Their flavor isn't all that strong but that's fine by me because this is everything I'd want this cake to be. I don't think there's a better product out that that truly captures the childhood nostalgia of dipping your cookies in an ice cold glass of milk. If I was Celebration Brands, I'd consider making their own line of ice cream cartons and producing this ice cream alone. For your next special occasion or just when you want an ice cream cake, buy this one. Your guests and yourself will thank you. Buy Again? No way I'm going back to those plain ones. Awesome review--congrats on your new apartment!! I hope you celebrate your 1-week anniversary there by reviewing the Reese's ice cream cake. Anon, thanks! That cake is pretty big but I'll see what I can do. Maybe have an apartment warming party or something! Dairy Queen does Blizzard Cakes with their flavor of the month, as well as a few classics. Their Chips Ahoy Blizzard Cake looks decent. I've only tried the Pumpkin Pie and Red Velvet Cake versions. 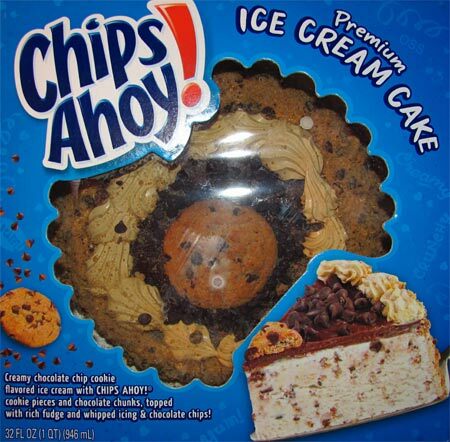 I'm not a big fan of Chips Ahoy, although I have tried a couple of their new Ice Cream Creations editions, just for kicks. Chips Ahoy seems to be a brand on the march. Somehow I suspect that the Blizzard of the Month being Chips Ahoy was more Nabisco's idea than DQ -- like... Hey DQ, you know how you use ten million Oreos a month in your Blizzards? Maybe we can get you a better price on them if you help promote one of our other brands! Josh, I know DQ does those kinds of cakes. However the closest DQ s around 2 hours from me so that wouldn't be all the convenient/reasonable. As for the blizzard of the month, that's how the majority of promotions work. Though I have a feeling that nabisco/dq have a long standing contract that requires dq to do a certain amount of nabisco themed blizzards. That's why we see all the different oreo blizzards, there was a nutter butter one, ect. Awesome what stores typically carry these? Anon, I first saw them at Wal-Mart last year but I've seen them in just about every normal grocery store lately. Just be sure to check the freezer in the bakery section instead of the ice cream isle! 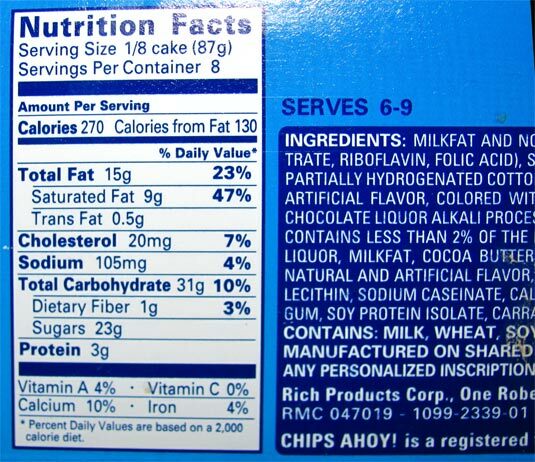 Chips Ahoy was the only cookie we ever had in our house growing up since it was my brother's favorite. Thanks for the heads up on this; I didn't even know it existed. Will definitely be brining it to Thanksgiving this year. Congratulations on your new apartment; that's really exciting! Hopefully you'll really enjoy being closer to school. Best wishes on the new school year!